Are you a predictably irrational investor? « Is Pamela Yellen related to Janet Yellen? UPDATED May 2016: With full confidence, I can say that you are irrational when it comes to investing. I know this not from talking to your broker or your mother-in-law, and I haven’t hacked into your portfolio statements. I know this because you’re human. What will happen in the stock market isn’t predictable. But one thing is absolutely for sure and for certain: Investors are predictably irrational. We’re not talking smart or stupid, sophisticated or naïve. We’re talking across-the-board irrational. So maybe you’re thinking that you’re the exception. You think you can handle the volatility of the market by just gritting your teeth and praying everything turns out all right as you roll the dice in the Wall Street Casino. Or maybe you think that at the first sign of trouble, you’ll be able to bail out of stocks and into bonds or money market funds to lock in your gains. The average investor in asset allocation mutual funds (which spread your money in a blend of equities and fixed-income funds) earned only 1.76% per year over the last 30 years! These investors didn’t even come close to beating inflation, which averaged 2.7% per year. And the news just gets worse: The 3.79% return investors in equity funds got over the last 30 years was almost two-thirds less than the return of the S&P index over that period! Pity those who invested in fixed-income funds. They only managed to eke out a .72% annual return, significantly trailing inflation and getting only a small fraction of the return of the corresponding benchmark. Shocking, isn’t it? But if you’ve noticed your investment accounts aren’t rising at the rate of the market, you recognize the truth of those numbers. How is it even possible for so many people to underperform the market indexes like that? The verdict is in: DALBAR, Morningstar, and the behavioral finance experts confirm that the majority of investors consistently buy and sell at the wrong times. Why? We’re human, and we humans make emotional decisions driven by fear (survival) and greed. But as financial writer Brett Arends warns us, “You can’t buy low and sell high if you buy high.” And that’s exactly what too many of us do. Maybe you think you’ve covered that problem by putting your funds in the hand of the professionals. Q: What percentage of mutual funds, financial advisors, and investment advisory services underperform the overall market? A: 80%, according to the Hulbert Financial Digest. And it’s not just because their fees reduce any profits. It’s because all the experts are human, too, which means they are predictably irrational like all the rest of us, buying and selling at the wrong times. Okay, okay, so maybe you are the exception. Maybe you’re the one in a zillion, that Superman or Superwoman, who remains calm, cool and collected as the market flips, blips, flash crashes and throws its tantrums. The problem is that you’re the one sober driver on a highway that’s loaded with drunks behind the wheel – how can you protect yourself from what they will do? 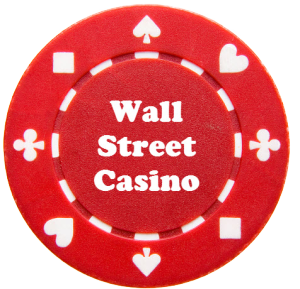 In the Wall Street Casino, we’re playing at a poker table that has its own inherent risks and uncontrollable odds against opponents whose moves are based on raw emotion, not the cards they hold. It doesn’t matter if you’re following the brilliant analysis of the most precise and accurate economist. The rest of the market isn’t. 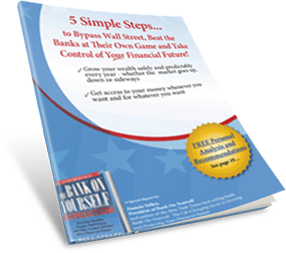 The Bank On Yourself method lets you know the guaranteed minimum value of your plan on the day you want to tap into it, and at every point along the way. It is guaranteed to grow by a larger dollar amount each year than it did the year before. And both your principal and gains are locked in – they don’t vanish when the markets crash. To find out what your bottom-line numbers and results would be if you added Bank On Yourself to your financial plan, simply request your FREE, no-obligation Analysis, if you haven’t already. You have nothing to lose and a world of financial peace of mind to gain.